This article first appeared in City & Country, The Edge Malaysia Weekly, on May 15, 2017 - May 21, 2017. When two prominent developers teamed up in 1973 to create the township of Taman Tun Dr Ismail (TTDI), little did they know that it would one day become one of the most sought-after addresses in the Klang Valley to live and work. The Urban Development Authority (UDA) and SEA Housing Corp Sdn Bhd developed 6,500 housing and commercial units on the 707-acre former rubber estate at a gross development value, at the time, of RM1.35 billion. Bordered by Pinggiran TTDI, Lebuhraya Damansara-Puchong, Jalan Damansara and Jalan Abang Haji Openg, and located in the west of Kuala Lumpur, this mature and self-sufficient township offers most of the modern conveniences — from schools and banks to retail and F&B outlets — and is home to public parks such as Taman Rimba Kiara and Taman Lembah Kiara. There are 13 banks in the township, including Standard Chartered Saadiq, Al Rajhi Bank and Maybank, and one of its oldest landmarks is its dry and wet market, Pasar Awam Besar TTDI. As TTDI went from strength to strength over the years, so did its property values. “Property values in TTDI have soared since its early days. One-storey terraced houses that were going for around RM34,000 in 1975 are today fetching between RM900,000 and RM1.2 million, depending on their location and extent of renovation,” says Henry Butcher Real Estate Sdn Bhd CEO Tang Chee Meng. Two-storey link houses that went for RM64,000 to RM70,000 in the 1970s can now be priced at RM1.1 million to RM1.8 million, he adds. Semi-detached houses that fetched RM90,000 then are priced at RM2 million to RM4 million today, depending on their location, land size and renovations. Bungalows stood at RM130,000 to RM150,000 then and are going for more than RM4 million today. CBRE|WTW managing director Foo Gee Jen says the value of 2-storey terraced houses appreciated 214% between 2005 and 2016 or from RM318 to RM1,000 psf. “The value of high-rise residences appreciated 459% between the late 1980s and 2016, soaring from RM125 to RM700 psf,” he adds. Over the past five years, there have been more transactions of high-rises than landed properties in TTDI, according to historical data released by the National Property Information Centre (Napic). “High-rises in TTDI saw more activity than landed properties with 455 transactions done between 2010 and 2016,” says Foo. Citing Napic data, Henry Butcher Real Estate’s Tang says strata units, including townhouses, accounted for 57% of all residential property transactions in TTDI last year. Investment-wise, landed, high-rise and commercial properties in the township offer good returns. “Landed residences have generated higher capital appreciation but high-rises seem to be enjoying higher rental yields. Commercial properties too provide better rental yields than landed residences,” he adds. CBRE|WTW research shows that the monthly rental rate for a 2-storey terraced house in the township is RM2,500, which means a yield of 2.55%. 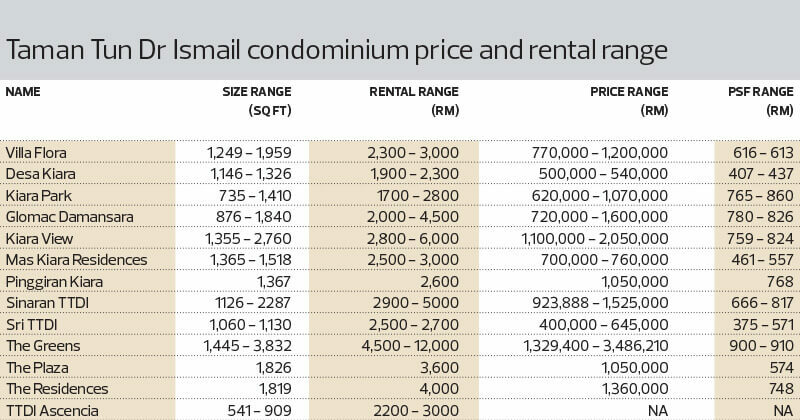 For apartments or condos, it is RM3,130 per month with a yield of 4%. Henry Butcher Real Estate data indicates that the asking rent for high-rises ranges from RM1,700 to RM12,000 per month. For example, in Kiara Park, 735 sq ft units fetch RM1,700 per month and the larger 1,410 sq ft units RM2,800 per month. In The Greens, the rent for its 1,445 sq ft units is RM4,500 per month and RM12,000 per month for its 3,832 sq ft units. With regard to rental rates for shops and office buildings in TTDI, CBRE|WTW records show that the asking price for a 3-storey shophouse is RM10,000 to RM11,000 per month, which means a yield of 3.5%. The combined size of purpose-built offices of more than 100,000 sq ft in the township — in Plaza VADS, KEN TTDI, Menara LGB and Glomac Tower — is about 1.26 million sq ft. Meanwhile, the gross asking rent for newer developments with GBI and MSC status is between RM6 and RM6.50 psf with a net yield of 6.25% to 6.5%. “There is very little undeveloped land in TTDI, so there are hardly any new projects in the area. However, this is a prestigious residential neighbourhood that is located not far from the KL city centre. It has a host of social and recreational facilities and is much sought after. Thus, demand for property outstrips supply,” says Tang. TTDI has many attractive features that make it a draw for property buyers, says Tang. Among others, it has a pleasant living environment with leafy streets and the Bukit Kiara park; property prices are more affordable than in Bukit Damansara, Bangsar and Bukit Tunku; its residents’ association is active; its condominiums are mainly low-rise and low-density; and the whole township is freehold, he points out. Foo believes property values in TTDI are resilient with minimum downside risk. “Due to limited supply, property prices will continue to appreciate strongly. Whether high demand is sustainable despite higher prices will depend on an improvement in household income and the country’s economic growth,” he says. He highlights that TTDI is favoured because it is close to popular commercial developments such as 1 Utama Shopping Centre in Bandar Utama, the Curve, Tesco and IKEA in Mutiara Damansara, and Tropicana City Mall in Damansara Utama. It is also located near prime housing areas such as Mutiara Damansara, Damansara Perdana, Kota Damansara, Bandar Utama, Damansara Utama, Damansara Jaya and SS2. He adds that unlike its neighbours, TTDI is situated within the Federal Territory of Kuala Lumpur, thus according its occupants a KL address. In short, says Foo, there is little to no reason to not buy in TTDI. Tang, however, raises concern over the old designs of some of the houses in the township and the insufficient parking space at the market and commercial areas. He also feels the high property prices have put the area out of the reach of the average Malaysian. The mature nature of TTDI also means its residents have a vested interest in any development that might impact them. Recall the protests in June and August last year against a nine-block, mixed-use development within Taman Rimba Kiara. Participants in the protests included the TTDI Residents’ Association, Friends of Bukit Kiara and management of several condominiums in the area. Of the nine blocks, a 29-storey tower comprising 350 affordable homes is meant for longhouse residents who live on the fringe of the park. These are former rubber estate workers who were promised proper housing three decades ago. The other blocks, whose height will vary from 42 to 54 storeys, will have a total of 1,766 units. The developer of the proposed project is Memang Perkasa Sdn Bhd while the site belongs to Yayasan Wilayah Persekutuan. Work has yet to commence on the project but according to a recent news report, it could be soon. Another development that TTDI residents are against is a proposed six-lane highway and flyover to be built to accommodate the growth in population density in the area. They are seeking legal advice on the matter. Foo reckons that there might be higher-density commercial and residential developments in TTDI in the future, which means property values will rise further. This is provided the existing public services and facilities are increased and maintained in line with the population growth. “More residential plots may be amalgamated and converted to commercial use in the future. However, this will strain the existing infrastructure, including parking facilities. This may become counter-productive if the area becomes congested and is no longer an exclusive residential area,” he says. Adzman believes TTDI will continue to attract the affluent due to its location and established address. “Any pocket of land suitable for development would have been spoken for by now. In fact, the limited land available for development has led to the less hilly areas, including those in Penchala, being developed. This is mainly Malay reserve land and will target Malay purchasers. As land value increases and building value depreciates, redevelopment is inevitable in TTDI in the future,” he says.